There are 2 SAP production certified options for a 2 TB RAM SAP HANA System on AWS. The column TOTAL ECUs displays the aggregated CPU performance. (SAPS have a near linear correlation to ECUs). It shows that from a cost angle X1 is always the better option if you need between 1.37 - 1.95 TB RAM. From a performance perspective it depends on the SAP HANA Workload. Analytical use cases which fully support scale out and distributed query execution (or well designed HANA Native Transactional Applications) will benefit from 64 additional CPU cores (128 additional vCPUs) of the R3 instances. Usually someone would also need to compare the effort based on the complexity of the deployment and operations as well. In the end X1 promises a Single Host HANA System, where 8 HANA Hosts are required with the R3 Instance Family. Ocean9 takes care of this complexity - the resulting user experience is always one button click. 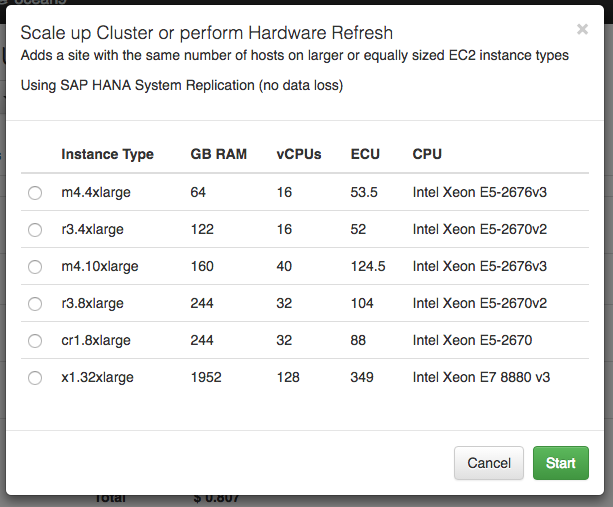 Isn't it amazing, that you can do a fresh provisioning, installation and configuration of SAP HANA on 2 TB RAM machines end to end in 16 minutes? In the classic world Sizing a SAP HANA System is a very important decision, requiring a lot of preparation time. In the cloud, high performance metal is available at any time in 7 global regions with 2 TB RAM per node. This enables a new approach to SAP HANA sizing. How about always starting with 60 GB RAM and scaling up or out when needed without data loss or downtime? In Ocean9, just click a button to either Scale Up or Out and its done. For scaling up production systems the user can start with 60 GB RAM then go to 244 GB RAM and then to 2 TB RAM. Every once in a while AWS introduces the next generation of the same Instance Family. In 2013, R3 succeeded CR1 with the same amount of memory and 5-50% higher SAP HANA performance. 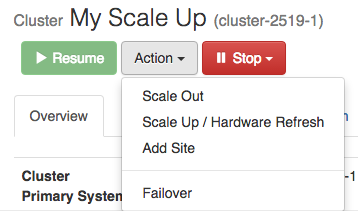 The Ocean9 scale up procedure can be used for Hardware Refreshes as well (One Click Hardware Refresh). For scaling out production systems the user could start with 60 GB RAM then scale up to 244 GB RAM, scale out to 488, 732 ... 4 TB RAM. 83 - 93 % of Infrastructure TCO of a 2 TB HANA system is represented by the AWS cost for compute & OS. With AWS On Demand Compute Pricing Model the customer pays for running machines only. For Non-production Systems an effective handling of Start and Stop is therefore attractive. A classic optimization approach is Uptime Scheduling e.g. 9am to 7pm on work days. This works well. Scheduling though is a cold approach as it does not consider users, who might want to work at different times or might be located in other time zones. In Ocean9 we provide IDLE based Auto Stop for customers. A HANA System will be auto suspended after a user defined IDLE grace period. For X1, An end to end stop takes about 12 minutes. An end to end start takes 9 minutes + Data Loading from Disk (EBS Volumes). For X1 Instances the data Load from Disk I yet need to benchmark. For R3 production deployments it is > 20 GB compressed data / minute / HANA host. Someone should not make assumptions about storage performance based on R3 numbers, as X1 instances utilize next generation AWS Networking and X1 instances come with a very different storage layout for SAP HANA. X1 represents the next generation of Compute and Networking not just for SAP HANA. It is amazing that anyone with an AWS account can test out Production Certified SAP HANA Systems in 7 global regions. With Ocean9 this is one click away. Contact us if you are interested in seeing it for yourself.